A U.S. Navy aircraft carrying 11 people crashed into the ocean near Okinawa on Wednesday. The Navy said eight people have been rescued, and they are in good condition. They're being cared for by medical staff on the USS Ronald Reagan — the aircraft carrier the plane was en route to when it crashed. This is the latest in a string of crashes involving the U.S. Navy Pacific Fleet. 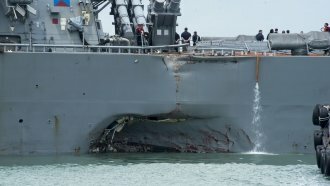 Two separate collisions involving the USS John S. McCain and the USS Fitzgerald left 17 people dead earlier this year. The Navy has not yet released the names of the 11 personnel on board the plane. Officials are still searching for the three missing people.